Easy Dinner: Asian Chicken and Cabbage Salad, Weekly Menu Plan. Shredded cabbage with a creamy peanut butter dressing is the base for this chicken salad. Sprinkled with sliced (or slivered) almonds and sesame seeds, it has a definite 'Asian' flavor. Cook quinoa in stock for 15 minutes, fluff when done and set aside. Put soy sauce, walnut oil, peanut butter, vinegar, 1 tbs olive oil, chili powder, ginger and garlic in a small bowl. Whisk well to combine. Slice chicken breasts into strips and toss with marinade. Allow to marinate for 15 minutes while you make the rest of the salad. When ready, heat remaining 1 tbs olive oil in a nonstick skillet over medium-high heat. When sizzling, add chicken and stir-fry 4 - 6 minutes, or until done. Trim snow peas and slice, at an angle, into pieces about 3/4" (2cm) long. Put cabbage, carrot, pepper, snow peas and chives into a large salad bowl. Add quinoa, and toss to combine. Allow to rest and the flavors to blend while cooking the chicken. 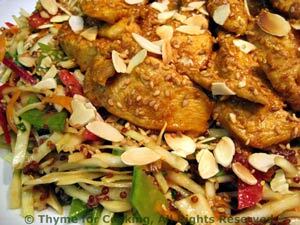 When the chicken is done, arrange on the salad, sprinkle with sesame seeds and almonds, serve. Put all ingredients in small bowl and whisk well.